One of the highest points in a teen's life is the high school prom. Dresses, corsages, the gym to decorate in the chosen theme, a tuxedo to rent and figuring out whether dad or mom will do the driving are all important aspects. And that's where the problem arises. No teenager wants to have to be driven to the prom by a parent. This is a time when he/she feels important and wants to act like an adult. The solution to this problem is very easy. 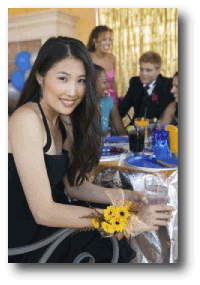 Simply call our Prom Night Limo Service and reserve a car for the big night and your teen will thank you forever. Get a group of the young people together and they will enjoy the evening's festivities, starting with the trip in one of our prom limos. Sharing the cost is another plus if you do this. Our prom limo service has two different packages that are sure to please everyone. Our Silver Package gives you the vehicle for up to one hour of service before the dance and up to one hour service afterwards. This service does not include additional pickups, so get your group together and enjoy the ride. Parents can be certain that our courteous, well-trained staff of limo chauffeurs will take care of anything that should arise during the drive. Our cars are inspected regularly and are in tiptop condition, so safety should not be a concern. Our Gold Package will give the patron an 8-hour service, with as many stops to pick up prom attendees as are needed, as well as staying at the prom to be ready for your group when it leaves. Again, you will be driven in style and comfort by one of our licensed, capable, limo chauffeurs, so there need be no worry about safety issues. Prom night is truly a fairy tale evening, and nothing can make it more of a fairy tale than driving in one of our prom limos. The sleek lines of the exterior, and the beautiful interior will make any teen feel very grown-up and special. Being driven to such an event is a real treat and one that will be remembered for many years. And Mom and Dad can go to bed knowing that their teen is in capable hands. We have been doing Prom Night Limo Service for many years and our clients are 100% happy with our vehicles, staff and attitude. We put the customer first and whatever is needed for that client we supply. For such an important night in the life of a teenager, only the very best equipment and employees will do. That's why you should depend on our prom limo service every time. Whether you choose to use our Silver or Gold package, you can be assured that you will be receiving the finest in quality, competence, and service. The peace of mind that this can bring to a parent is priceless and can make the difference between a restless evening and a peaceful one.